Did you have a great Easter? We did, but as usual, it has meant that my kids have now got a CRAZY amount of chocolate to work their way though! I have devised a bit of a cheeky tactic to use some of it up FAST so it isn’t hanging around my kitchen for too long (otherwise I will eat it!). Last year we made some delicious Chocolate Banana Bread to use up some of our excess eggs but sometimes I find the kids don’t actually get that much out of baking with me apart getting to lick the spoon at the end! 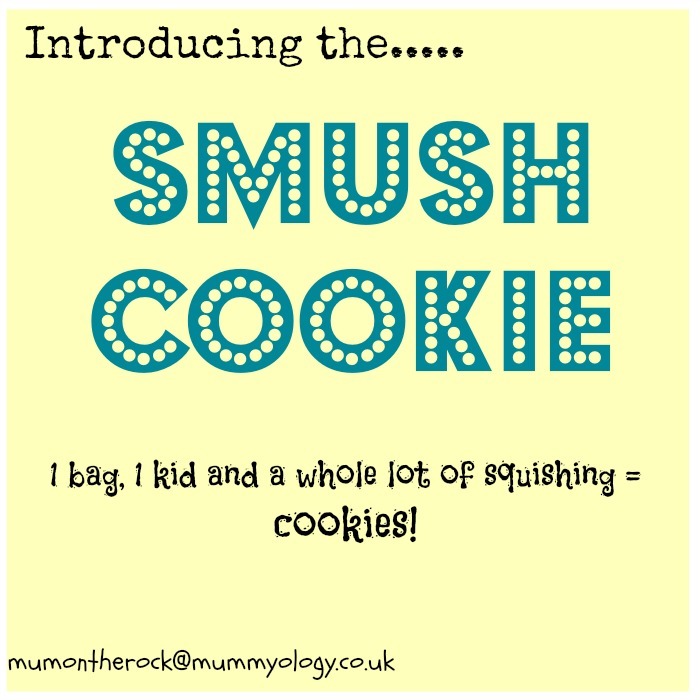 If it involves too much whizzing and mixing they loose interest so I had the idea that maybe we could create some cookies by simply smushing the ingredients together in a zip loc bag….really hands on, super for the senses as it feels amazing AND you get great cookies at the end – perfect! 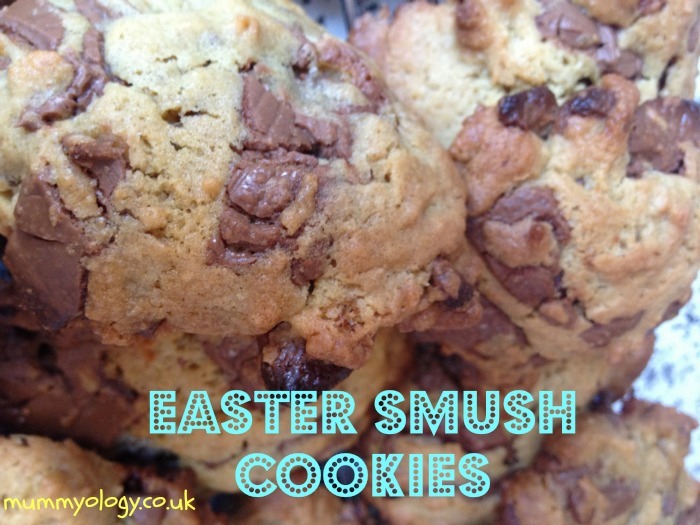 SO the Easter Smush Cookie was born and it makes the best chewy on the inside, crunchy on the outside type of cookie ever – yippee! Wanna have a go? This is enough to make about 25 cookies! I was cooking with my two girls cooking with me so divided each ingredient into two bags so they could make some cookies each. 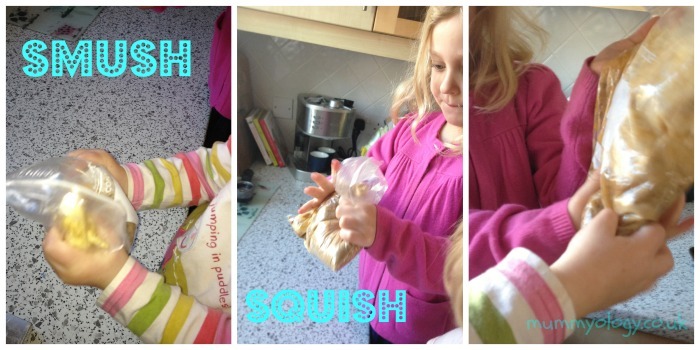 First you need to place your butter and sugar into your zip loc bag – and get squishing! Squeeze and squish it all together until it is creamy and you can’t see many lumps of butter. Don’t worry if there are still some little lumps, they will work their way out in a bit. Next add the eggs, seal the bags back up and squeeze and squish some more! This gets the mix all runny and oozy and looks a bit curdled and yucky but don’t panic! Mix the flour and the bicarbonate of soda together. Open up your bags and smell the yummy mixture even if it looks funny! Spoon in the flour – seal your bags once more and get ready for your final big squeeze. 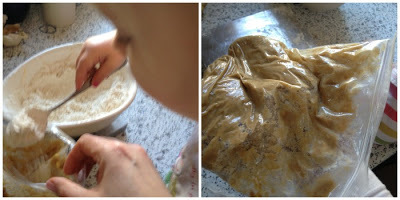 Make sure the flour gets really mixed into the oozy mixture – you will see it actually start to look like cookie dough! Now for more fun… choose your chocolate! We used up loads of hollow milk chocolate eggs we had so needed to take their shiny wrappers off and bash them up in a separate bag. It was great fun with a meat tenderising hammer! You could use any kind of chocolate really; 12oz is a lot and makes for very chocolatey cookies so you could also use less if you don’t have as much. 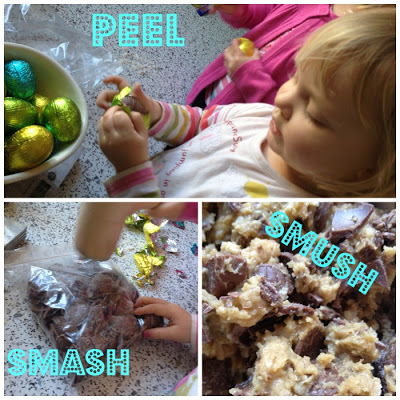 Open up your dough filled bags and add in as much chocolate as you have to the dough. Be careful not to squeeze too hard as you might pierce the bags. Now you know why you needed a big bag too! Once everything is mixed up, place spoonfuls of the chunky mixture onto a baking tray. Our cookies didn’t spread too much but it’s best not to put them too close to each other on the tray. Bake for 10-12 minutes. Once golden looking move them onto a rack to cool using a spatula. 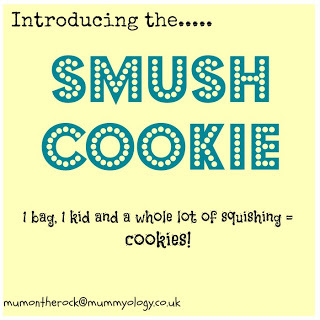 You should end up with a gorgeous chewy choc filled ‘Smush cookie’ and all you have to do now is ditch the gooey bags. The possibilities of extras that you could ‘smush’ into your cookies is endless… raspberry and white chocolate, blueberries, raisins, nuts who knows, have a go and let me know! I know you could easily make these in a bag but do you know what, its quite a lot of fun not to! There’s no such thing as leftover chocolate at my house, but I may just have to grab some at the store so we can try this recipe! Looks delicious and the smushing is sure to be a hit!